How many times have you desperately tried to squeeze that last little bit of toothpaste out of the tube as you frantically get ready in the morning? You know it’s in there, but it’s almost like the toothpaste company doesn’t want you to get to the last bit for whatever reason. The world of packaging and container design is constantly evolving. Packaging companies are getting creative with new and exciting ways to present a product to consumers to increase efficiency, save money, and decrease the impact that packaging materials have on the environment. With all the advancements currently happening, there’s no doubt that collapsible packaging is one of the biggest trends in the packaging industry. From toothpaste to tea bags to entire king-sized mattresses, collapsible packaging seemingly has a place in just about every market out there. And now, SLC Custom Packaging is jumping on on the collapsible packaging trend with their new accordion bottle design. One of the first of its kind on the market, the accordion bottle is an innovative method for dispensing products that will save both you and the consumer time, effort, and money. Here are just a few benefits of choosing to package your product in an accordion bottle. Let’s talk about the toothpaste bottle again—with current toothpaste tube designs, you’d literally have to cut into the packaging to get out every last drop of the toothpaste you paid for. Not only that, but the excess toothpaste makes the tube nearly impossible to recycle. In a report conducted by liquid lubrication company LiquiGlide, it was found that 89% of people surveyed felt that poor packaging is a “huge waste,” and nearly two-thirds of respondents were bothered by how much money they were giving up as a result of poor product packaging. These kind of reactions can be harmful for your business and can potentially ruin your customer loyalty. With an accordion bottle dispensing your product, you can guarantee that your consumers are getting exactly what they paid for—the accordion bottle’s patented recessed bellow design guarantees that your customers are getting 99.9% of the product out of the tube. The ergonomic dispensing shell on the bottle also makes dispensing the product a breeze—from the first squeeze down to the last drop. You can spend a countless amount of time rifling through the many packaging options at your disposal these days. Finding the packaging or container that aligns with your product vision while still providing the most efficient and cost-effective item to your customer is important to the future success of your business. Fortunately, it is more than likely that the accordion bottle will fit the bill for your packaging needs. It doesn’t matter if you’re selling an adhesive or household cleaner, shampoo or toothpaste—the accordion bottle is designed to be compatible with nearly all semi-viscous fluids. The accordion bottle also comes in 12- and 24-ounce options, allowing you to pick the size that fits your needs. Never judge a book by its cover. But you can most certainly judge a product by its packaging. In an excerpt from “The Impact of Packaging, Price and Brand Awareness on Brand Loyalty: A Reseller Perspective in the Mobile Sector of Pakistan,” the authors iterate the important link between a product’s packaging and the trust in the brand, calling it “the source of communication” between a brand and the consumer. This line of communication can also apply to the utility that your packaging will provide to its user. Brand recognition and loyalty is vital to the continued success of your organization. It is your responsibility to not only create a product that your customers will love, but present it in packaging that will keep them coming back time and time again. The accordion bottle will help bolster that brand awareness and customer loyalty simply because they know they will be getting the full value of the product they are paying for. 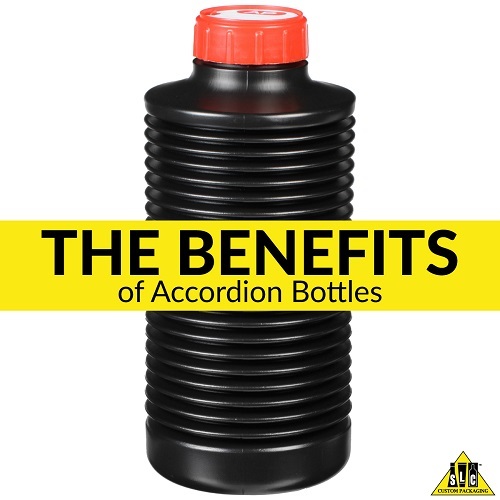 Could your product benefit from the accordion bottle? Give your customers what they paid for. Contact SLC Custom Packaging today to see how the accordion bottle can help establish or improve your customer’s trust and overall satisfaction today.